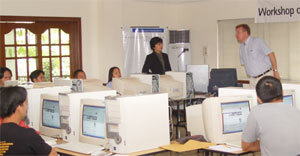 The Friedrich-Naumann-Foundation (FNF) conducted a hands-on website development workshop for staff of members of the Liberal Party (LP) from February 19 to 20, 2004 in Makati City. The two-day seminar was the first in a series of activities of the "Websites for Liberals" project that aims at getting more Filipino liberals online. "The center of all politics is communication, and the Internet, though not a mainstream media today in this country, is rapidly gaining importance," said Dr. Ronald Meinardus, FNF-resident representative and one of the facilitators of the workshop. He added that the Liberal Party, as a modern and progressive political party, should harness the Internet as a political communication tool. Participants of the workshop were provided with lectures and reference materials; they also engaged in actual exercises on web writing, web information architecture and web page design and started working on the websites of LP-politicians soon to be uploaded.